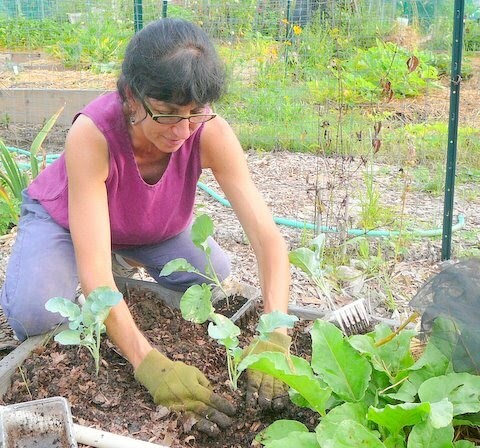 Susan Levi-Goerlich went down her checklist as she prepared to plant a fall crop of broccoli: 13 seedlings, box of worm poop, straw, and tutu fabric. 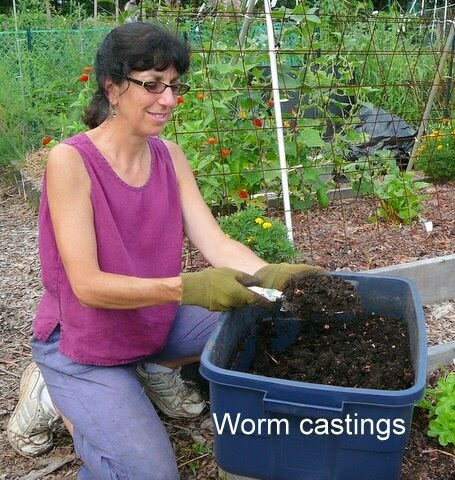 Susan, who presents a popular Master Gardener educational program on vermicomposting, fertilizes her garden with worm castings, known to giggling youngsters everywhere as “worm poop,” from red wiggler worms that compost the vegetable scraps from the family’s kitchen. When she dug holes for the broccoli seedlings, she trowled a heap of castings into each. “Broccoli is a heavy feeder. It seems to do well with the castings. I don’t supplement it with commercial fertilizer,” she said. Tiny red wigglers squirmed as she added the supplement to the planting bed. After she firmed the soil around the transplants, Susan mulched with straw. “That will help minimize weeds and keep the soil shaded and cool around the young plants,” she said. 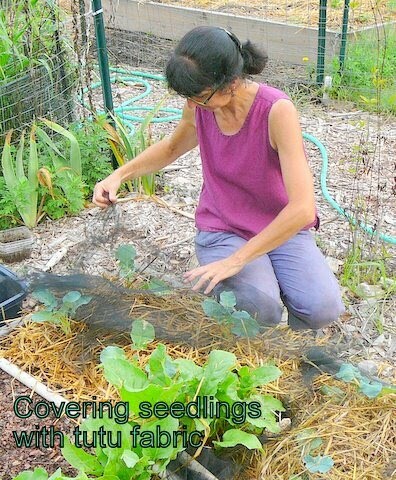 And then she adds the crowning touch to her broccoli planting—tutu fabric, more formally known as tulle—to protect the plants from cabbage butterflies and moths and harlequin bugs. When she’s not gardening, Susan is a fabric artist. “Much of my work is inspired by garden imagery. Up to now it’s mostly been flower gardens. But I’m working on a piece now based on a friend’s garden, and it includes corn too,” she said. To see examples of Susan’s fabric art, CLICK HERE. Tulle… what a fantastic idea! Thanks for sharing it. Tulle is just another tool for creative gardeners. I like the idea of using tulle. I use little scraps of bird netting for many things – like laying over my melons and winter squash so the raccoons don't get them. I don't like how the netting snags on everything and I wonder of the tulle would work better. 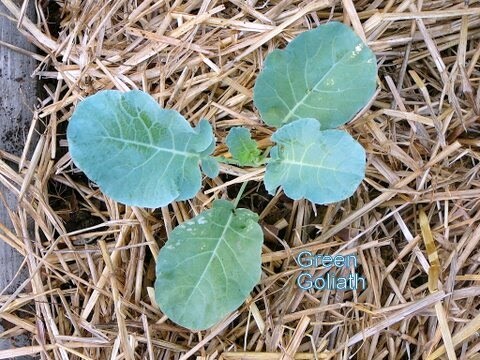 Anyway, great broccoli tips – especially as we approach fall planting! Wendy, I have not had a problem with the tulle snagging. As I told Bob, I use the really fine mesh, and once it's in place I don't really move it—except to unroll it from the PVC pipe to allow more room for my growing plants. The tulle is certainly worth a try; however I'm not sure how well it will hold up to raiding raccoons. It's not as strong as bird netting.